There wasn’t a cow in sight but the town was out in force this morning for the annual Bangtail Muster in glorious autumn weather. 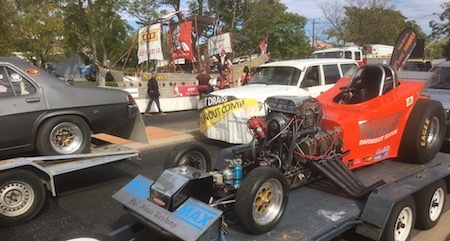 The fund-raiser, which started in 1959, is organised by the Rotary Club of Alice Springs. It attracted 30 community groups to strut their stuff, many of them with dozens of members on the floats and doing displays. 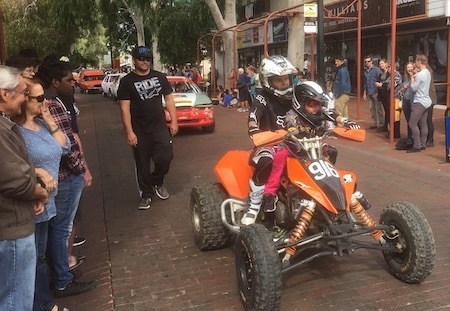 The focus was on children from pre- and primary schools and sporting clubs, as well as the town’s enduring obsession with fast, hot and noisy conveyances from heavy street motorcycles, to off-road bikes, drag cars and speedway machines. 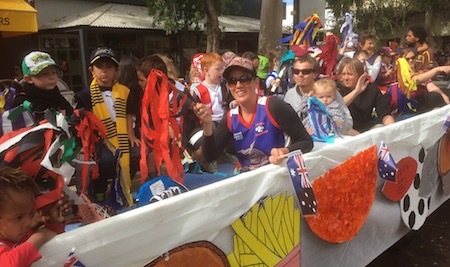 Judged Best in Parade through Todd Mall was Braitling Preschool, Best Pre School was Gillen, Best Community was Araluen Christian College and Best Other was the BMX Club. For the Harley Owners Group it was fitting finale to a weekend with some 500 like-minded bikers in town from all over Australia. 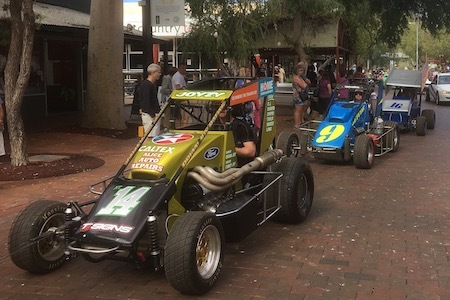 The event, named after a cattle industry method of counting stock by chopping off the ends of their tails, raises money for charities such as sporting facilities, helping senior citizens, assisting the hospital and the John Hawkins Memorial scholarship funded by the Rotary club. The fund is named after a local surgeon and provides grants for higher education. 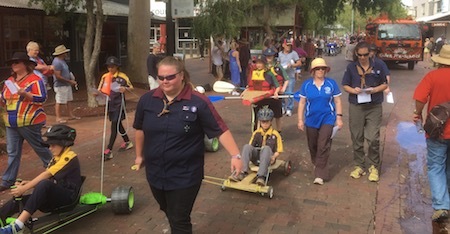 Spectators tossed $1300 into wheelbarrows pushed by club members along the Mall, including three very young children each contributing hundreds of coins they had obviously been saving for a very long time. The Town Council organised the traffic management plan and assisted Rotary members to become qualified in carrying it out. “This saved us thousands of dollars and literally made it affordable to have the parade,” says director of the event, Eli Melky (a town councillor himself). As befits Labor Day there was also a political element. Some 25 members of the Electrical Trades Union marched with banners and chanted slogans, expressing their dismay about the handling of human resources issues by Territory Generation’s imminent closing down of the Ron Goodin power station. Another Bangtail Muster, another beaut thread in Alice’s rich social tapestry. The May Day event celebrates a terrific community spirit bringing everyone together, including our American friends from the Space Base. I cherish the memory of the May Day Sports Carnival that took place in the arvo at Traeger then in later years at Anzac Hill oval from the 1960s to 2001. Youth Centre matriarch Mrs Joan Higgins and her merry band at the Youth Centre made the Sports Day a wonderful coming together of all sections of community. Foot races, rolling pin throwing, the tug of war…and lots of laughter. A very happy day for the people of Alice. Rest in Peace, Mrs Higgins. 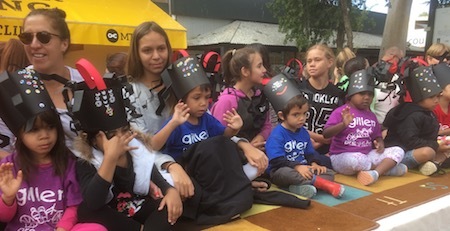 You helped make Alice community the place to be on Bangtail Muster arvo.